Crisp cook asparagus. Roll out thinly sliced fresh bread. Spread with a good quality mayonnaise. 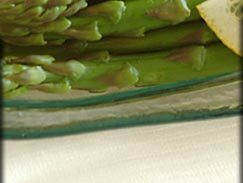 Place an asparagus spear on each slice and roll up. Sprinkle over a little paprika.